Who? Born in Texas in 1984, Brooklyn-based artist Rebecca Ward creates process-oriented abstract art that harmoniously unites her love of colour and geometry. 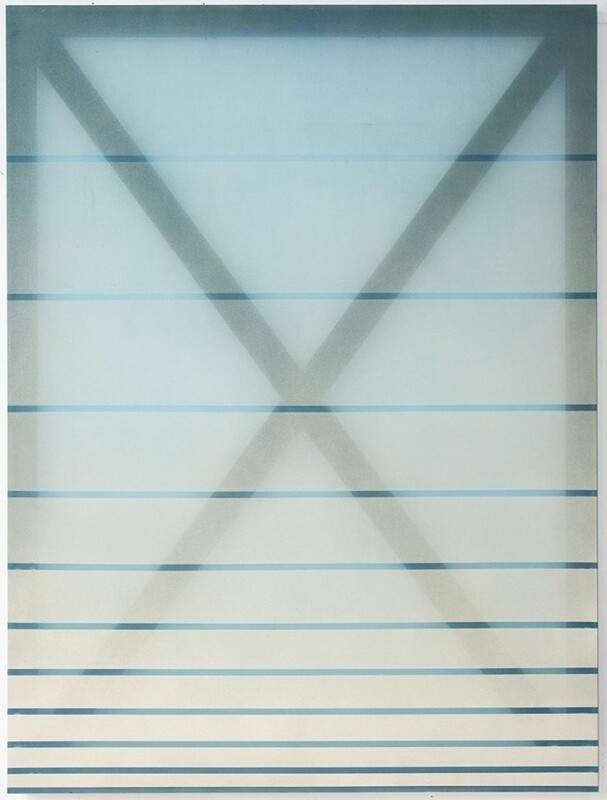 Spanning painting, sculpture and installation, and influenced by both minimalism and arte povera, Ward's work explores age-old concepts like the interaction between space and architecture, while also addressing broader social concerns, such as the exploration of gender roles. 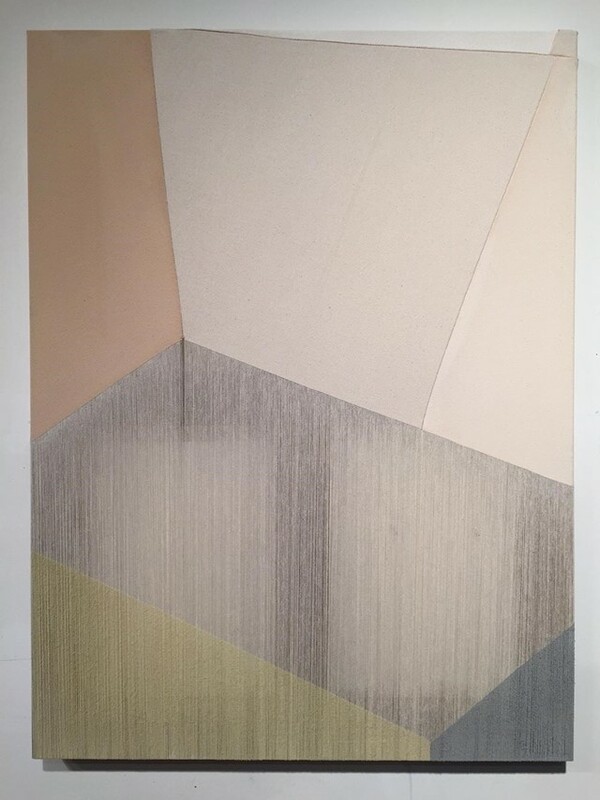 The latter she achieves by employing techniques and materials conventionally associated with domesticity – for example the dyeing, sewing and bleaching of textiles – to achieve geometric abstraction, a traditionally male-dominated field of minimalism, thereby breaking the genre open with a distinctive female delicacy. All things considered, it's little surprise that in spite of having only graduated from the School of Visual Arts in New York in 2012, Ward has already attracted international acclaim and a spate of high-profile fans including Stella McCartney, who commissioned the artist to create a dynamic tape installation for her Manhattan flagship. What? Wardʼs new body of work is currently on show at the Ronchini Gallery in London. Titled aphasia, the exhibitionʼs name alludes to the complexity of geometric abstraction, while simultaneously demonstrating the artistʼs interest in areas of science and neurology. 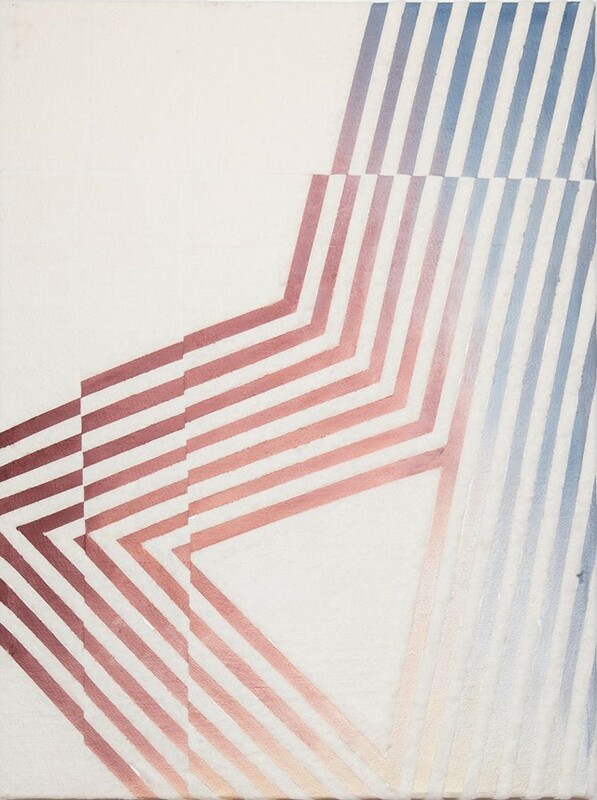 Ward works with a variety of techniques, including oil paintings made of de-threaded and re-stitched panels, angular rainbows of peach and sky-blue, alphabet-shaped frames, and translucent silk canvases on which dyes and textiles give the impression of three-dimensionality. Her unique aesthetic allows texture, narrative and colour to intertwine, creating luminous works that communicate with one another as well as the viewer, melding minimalism and artisanal craft. Why? While her art may not appear political at first, behind the pretty tones and intricate canvases lies an undertone of subversion. The artist explains, “although Iʼm using traditionally female-associated processes to make my work, I am also overtly referencing male art giants and forms that are typically masculine”. Ward deliberately avoids using curves or circles in her work, explaining, “my hope is to blur the boundary that exists in gendered work altogether.” Some works are also particularly autobiographical – the letter-shaped paintings symbolise the initials from important people in the artistʼs life, while some of the titles reference emotional states or personal histories. So with just over a month left in the showʼs run, the Ronchini presents a chance to experience the innovation subversion and creative personal language of this talented and exciting young artist. Rebecca Ward: aphasia is at the Ronchini Gallery until December 5.